I'm continuing to update my Etsy Shop this week. 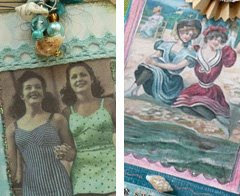 I've added some collages and tags from my "Summer At The Beach" series, inspired by a weekend trip to our cottage. 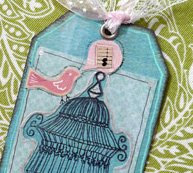 Also added is a series of tags I created called "The Caged Bird Sings." I have more Destash items coming too, as soon as I can get them photographed and listed. The fishing themed rubber stamp sets from the previous post have all sold out. I'm so pleased that they will be going to good homes where they can have a new lease on life. I have LOTS more themed rubber stamp sets to put together and list in the shop. These are all so beautiful! I'm completely enamored with the soft color palette you've used.